IMPORTANT: flats with thicker soles and sturdy heels are much more supportive than completely flat flats that feel too close to the ground. As I responded to Rachy on the blog post this morning, I think a VERY flat and unsupportive flat looks and feels the least nice. You’re after flats with solid soles with at least half to three quarters of an inch in heel height. The feet look more supported that way – to my eye, anyway. I look for flats that are sturdy on the bottom despite their delicate and refined aesthetic. Flexible soles are important too, but not TOO flexible so that the flat feels floppy. As far as arch support goes, my low arches can't handle a lot of it. I like GENTLE arch support. Shoes with mega arch support like Danskos, Birkies, Earth and Vionics feel like I have a rock under my foot. I get my support from the soles and sturdy heel. But if you need flats with arch support, you CAN get them. At the risk of boring you again with my own flat footwear, these are the best examples of what I mean from my footwear capsule. Thanks for your visual of supportive flats, Angie! Always helpful, and fun to see the ones you're actually wearing, too. I'm considering these. Ideally they'd be pointy toe but I'm not finding what I want in retail and am strongly considering these. I haven't seen them in person but am hoping they are supportive enough for my slightly wide pretty flat feet. Totally agree on your idea of what makes a good flat. I also look at the construction of the sole. I prefer leather, including the heel, but a little bit of rubber or other synthetic that provides some cushioning in addition to traction is the ideal - especially when one is logging miles in an urban environment. I have high arches so finding shoes with good support is essential for me. More so as I get older. ABC, those look like they might work well! I think Angie mentioned in another post that Camper can be a little roomy. The support and cushioning look great. My flats are always 2-3cm. heels , not absolutely flat. Totally agree about the need for support, structure, cushioning - distance from the sidewalk. I can still wear heels and sometimes find them surprisingly comfortable. What I can't wear anymore is thin soled flats. Yes, this! I think this is why brands like Munro and Clarks work so well for me in flats. They have a thicker sole. I feel like European shoes have a bit of a heel and more support, generally. If I lived in a rainy climate, a thick sole or even flatforms would be a necessity. Just idea. If the heels of my flats are low, I mean less than 2 cm, my shoemaker adds another layer about 0.5 cm and then it's great. I do that regularly, even if it's 2 cm . Completely agree. 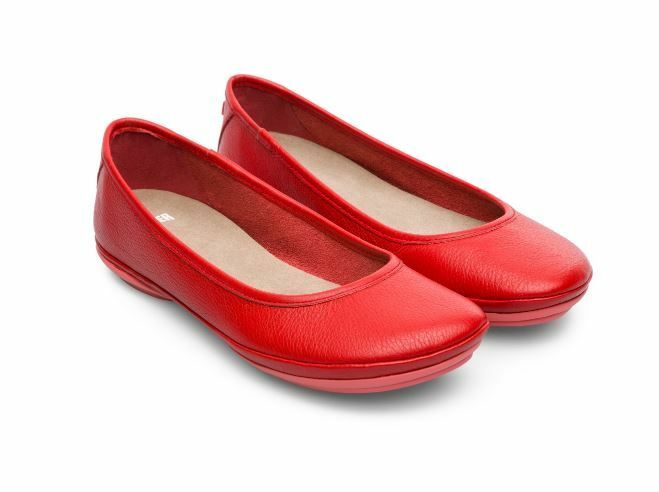 After years of flimsy flats I now stick to Clarks and Naturalizers with a minimun 3/4 inch cushioned heel or sole. My arched feet won't tolerate anything else. It also hurts my feel to feel all the stones and street irregularities through a thin sole. Thick soles are protective. Sorry to hear that you have come down with a cold. Summer colds are no fun at all. I love how you have explained why "flat flats" just don't work for my fussy low volume feet. I need a bit of a heel and padding to make my feet happy. You have a great collection of footwear, if my feet weren't so difficult, I would order the Dolce Vita boots, because the heel height on those is perfect for me. This is a great tip! I will be keeping it in mind as I shop for comfy shoes. And I never bore of seeing your collections. Yes, this is so true. I have very high arches and need support. With closed shoes I can put a support in, but not with sandals. abc, nice to see you. Those Campers look great and I hope they work. They run wide. I'm nodding along with all of you, ladies. Thanks for your thoughts and extra tips. Eileen Fisher makes the only shoes and booties I can wear without an orthotic. Many of her styles have a very stiff unflexible sole, I can vouch for it's comfort. Some of her shoes have excellent arch support and most have good cushioning. She's my go to for dress shoes. Ariat still has one of the best supportive insoles of any brand on their regular boots (can't attest to their fashion boots, I don't think it has the ABS insole). I can't rave enough about how good my new espadrilles feel. They're flatforms. They're nice and stable on the lumps and bumps here in the country, and they're comfortable too! Gryffin, I MUST look into Ariat for Winter. Cindy, KILLER espadrilles. Wow. Enjoy. Thanks, Angie! That makes me even more hopeful the Campers work bc my foot is kinda wide. I'm going to give them a try as soon as I can get to the mall Thanks again! Agreed. As someone who tends to be hard on my shoes I also find shoes without much of a sole get scuffed and dirty much faster. They are just too close to the dirty city streets I walk on. High five on the low arches thing. You put into words something I have puzzled about for the last couple years. (I think my arches used to be higher.) One of the many reasons I have always loved your blog is your sensible approach to stylish footwear. I have high arched (but very narrow feet) and even with my flats need at least a small wedge for comfort. The mules though dont look as cushy as the others, do they have hidden arch support? Yes. Mentally reviewing my go tos and they all have some cushioning and the very best have a thick sole. Thought these were worth a shout out. I have low volume flexible flat feet and have a morton's neuroma in my left foot. I wear orthotics 24/7. So it is incredibly difficult to find a comfortable truly dressy flat. Peau de soie or black suede (because it looks like velvet) reads dressier to me. I can't wear a ballet flat because they don't stay on, same with typical d'orsay. When I saw these EF Dear Strappy flats, they appealed for their pointy toe, true saturated black suede, d'orsay but with elasticized straps to keep them on. EF because of cushioning, stiff but pliable sole and secure heel balance is the only brand I can wear without an orthotic without pain. I usually have to 1/2 size up for all EF. These shoes run TTS despite the pointy toe. The heel is 1/2 in and the sole so divinely comfortable I did not want to take them off. The strap strap closest to the ankle holds the foot very securely. The two distal straps are loose, not terrible, but I'm afraid to take them to a shoe maker because I think they might get ruined if they tried to shorten them. Because I would never wear these without stocking or tights (black of course) I don't think this would be noticeable. But I've been hunting for a dressy flat for the foreseeable forever and they feel so good on - I did not want to take them off. Like walking on little pillows! So, I am leaning toward keeping them. If you have slightly higher arches I would think you would fill these out better. But EF is always worth a try on. I was sad the tilda was just too high a heel, so elegant, but comfort trumps looks any day!